Intimate relationships are massive, murky territory. They’re crisscrossed by a tangle of motivations—lust, love, attachment, loyalty, necessity, and more. They’re the heart of darkness and the heart of light, too. By their very nature, they defy rational analysis. We stumble into relationships and do our best to muddle through. For most of us, being in a relationship is like trying to drive from Albuquerque to Newfoundland without a map. An understanding of the three core yearnings that drive our behavior in relationships. Insight into a paradox that is inherent in all relationships. We yearn to be autonomous and we also yearn to connect. The result: we’re often out of synch with our partners, not to mention ourselves. Relationships require ongoing management of this tension. A visual map for understanding the dance of relationship and how to manage it skillfully. In the context of action, we humans thrive on concreteness. We benefit from clear mental maps. Yet, as noted earlier, we tend to navigate our relationships without them. By this map, there are five chambers in the house of love. In this book, you will learn what they are, how to identify which one you’re in, and how to migrate to one that feels better. The understanding that the work of relationship includes Tiny Country Creation. We are all Founding Fathers and Mothers in our intimate relationships. Carl Frankel is a writer, entrepreneur and Sheri Winston’s partner at The Center for the Intimate Arts. A national thought leader on sustainability and socially responsible business, his acclaimed 2004 book Out of the Labyrinth offered a model of psyche and culture that provided deep insights into the nature of our global challenge. 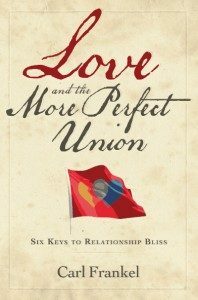 With Love and the More Perfect Union, Frankel brings his special aptitude for high-level modeling and insights to the world of relationships.